The geopark area, which was created by lava from volcanic eruptions that occurred 10,000 years ago, offers a unique landscape for visitors to explore. Interest in Kula Geopark, a site listed in UNESCO's Global Geopark Network, has increased elevenfold over the past five years. 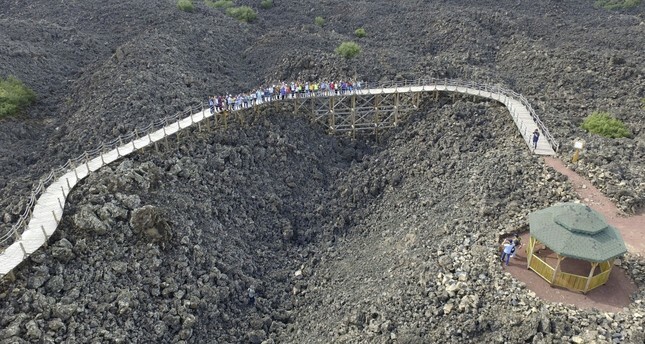 The 305-square-kilometer area, which was created by lava from volcanic eruptions that occurred 10,000 years ago in the Kula district of western Manisa province, offers a unique landscape for visitors to explore. People who wander among the volcanic cones and lava residuals often spend hours taking photos on the extinct lava flows and even collect lava stones as souvenirs. Up to 2013, the geopark hosted an average of 7,000 to 8,000 visitors annually; however, after it was registered on UNESCO's Global Geopark Network, the popularity of the site exploded. It now welcomes 90,000 visitors annually, 11 times the number of five years ago. Kula UNESCO Global Geopark Coordinator Tuncer Demir told Anadolu Agency (AA) that the geologic features of the district are unique and that the historical reports of the geopark are archived. While discussing the fact that the area attracts tourists as well as scientists, Demir said: "Geologists from different European countries have been conducting research here for nearly 20 years. The results were published in the most prestigious journals of the world. Geologists' interest in the spot increased after the articles were published once they learned that the youngest and oldest volcanoes in Turkey are located here." The coordinator stated that the interest in Kula Geopark has continued to increase every year. "The geopark was not very popular in the past; however, an increasing number of people visit the area now. This number has continued to grow, especially after the area was included in UNESCO's network. Tourists from both Turkey and abroad are curious about it. In the beginning, around 7,000 or 8,000 visitors came annually. Today, we average between 80,000 and 90,000 by September. I think we could attract even more tourists with proper advertising and promotion." Nuran Koyuncu, a geography teacher who visited the park, said she became curious about Kula Geopark after reading about it. "We knew that it is the first and only geopark in Turkey. It is more impressive and better arranged than we expected. It is a beautiful laboratory in terms of geology and a perfect place for surface exploration." Another visitor, Dilek Birgül, reported: "I knew that this place was special, but what I knew was all from books. I'm leaving the geopark now thinking that its unappreciated. I'm a teacher and want to bring my students here. It is a place that shines light on the geological structure of Turkey."